So, basically this way I can use a smaller starter and still be good. I usually use dry yeast, but this easy smaller starter method would make using more liquid yeast a good option. The smaller starter volume comes from pitching at high krausen. As I mentioned above, it is important to use a vessel that is at least four times the volume of the starter, and the media must be shaken until there is more foam than liquid, preferably as much foam as the media can produce (it is very difficult to shake a starter that vigorously without a screw on cap). For example, using a 2L flask to prepare a 1L shaken, not stirred starter is a no-no, and so is using a 1 gallon jug or 5L flask to prepare a greater than 1L starter. I used a 1 gallon jug to prepare 1 quart and 1 liter starters for years before I found NOS 5L and 10L media bottles at price points that I was willing to pay. I used the shaken method last weekend and pitched a very active 1.6 liter starter (with 160g of dme) pitched about 18 hours after making the starter. I was surprised at the gravity reading I took yesterday, 6 days after brewing, which had gone from 1.048 to 1.020. I really expected it to be finished by now. It's a Belgian Witbier recipe that I've made a dozen times or so using Wyeast 3944, fermented in the mid 60'sF. So that's one variable that would be measurable, if it's not an anomaly. How big was the container in which you prepared the starter? The container has to be at least four times the volume of the starter. Wow...why is that Mark? I made a 1 qt. starter in a gal. jug, but I often use that same jug for 2-3 qt. starters. How does vessel size relate to starter quality? Thanks! I'm guessing it has something to do with the amount of air-to-liquid surface area achievable at that volume. I think low cost and low tech are great, but I don't know anyone who has experienced shear stress so it seems weird to worry about it. It seems like worrying about HSA all over again. The requirement has mostly to do with expansion into foam. The method is dependent on turning the media into as much foam as is possible because foam has a very high specific surface area, and gas dissolves into a liquid at the interface between the gas and the liquid. A liquid-gas foam composed of gas entrapped in very thin layers of liquid. I would appreciate your adding the vessel volume to starter volume ratio requirement to the blog entry because methods have a way of getting blown out of proportion on the Internet. 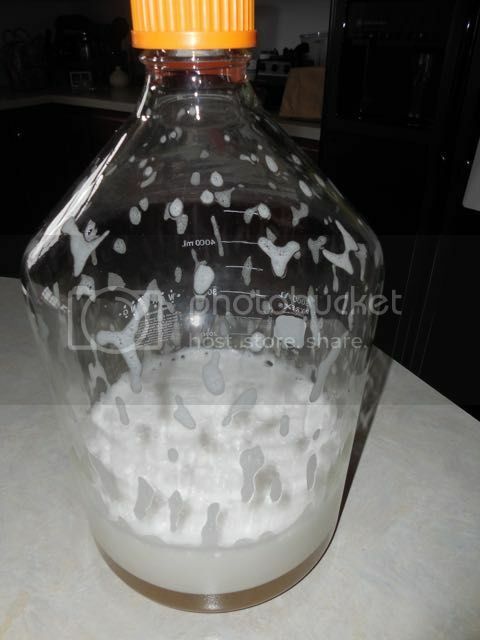 Yeast rinsing is an example of what happens when a very specific method is let loose in the home brewing community without bounds being placed on it. Yeast rinsing is a generalization of a method used to store colony forming units under autoclaved distilled water in a laboratory setting. However, the generalization does not meet the original requirements for having an absolutely nutrient-free culture, nor does it include that the storage solution has to be autoclaved distilled water. There's no way to rinse a cropped culture completely free of nutrients in a home setting, as the process requires a centrifuge. Not even close. This was a flask marked 2000 below the neck. Quit changing the rules, Mark. You know a lot of people who have experienced shear stress; however, they are assuming that the results of shear stress are from oxidized wort. The foul odors and off-flavors produced when a culture is made on a stir plate are the result of shear stress from spinning the bar fast enough to create a vortex. The vortex is a doubled-edged sword. Without it, the culture does not receive adequate aeration without direct O2 injection or shaking the starter before stirring. With it, the cells experience significant cell shear stress on their cell walls. There are many patents that attempt to overcome the shear stress problem in continuously stirred bioreactors. The cells in a shaken, not stirred starter are only subjected to shear stress during the initial shake if the culture is pitched before the starter medium is shaken, and not exposed to shear stress if the medium shaken before the cells are shaken. I agree with both of you guys! I don't know that I've been experiencing shear stress, but OTOH I don't know that I'm not. This is one way to start finding out. I did not change the rules. I have been stating the vessel volume to starter volume requirement since I started discussing the method. Funny how my last reply came just after the whole discussion of size which I didn't see until later. There are no foul smells. However there is dms present in the canned wort before adding the yeast and esters after from making a starter at 75. I seem to recall that you shake and then slowly stir the culture.